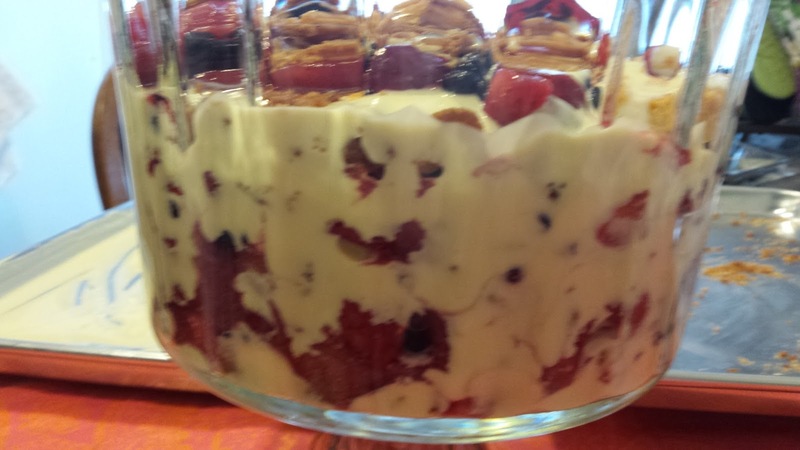 Readers of the past few blog posts will have noticed my mention of Three Berry Trifle. I’ve made the components for it, and now we’ll put it all together. This can be made in a traditional trifle bowl, or any container with clear sides. The beauty of a trifle is seeing the separate layers on the sides. This makes a lot of trifle. There were about 20 or so people at the party I took this to (along with Coconut Macaroons with Chocolate Chips). All of the cookies were eaten, and most of the trifle – just enough left over for the host and hostess to have one more serving each. Use a trifle bowl or other large clear-sided container. Cover the bottom with a layer of croutons. Spoon pastry cream over cake, spreading it out to cover the cake, and making sure it shows on the side of the dish. Top with macerated fruit. Continue layering in this order until you’re done (3 complete layers, possibly 4). I spooned some fruit onto the top, and sprinkled the pound cake crouton crumbs over the fruit. Chill in the refrigerator for several hours before eating. Enjoy!